Following a panel discussion among sergeants major and senior DoD civilians, panel moderator Sgt. 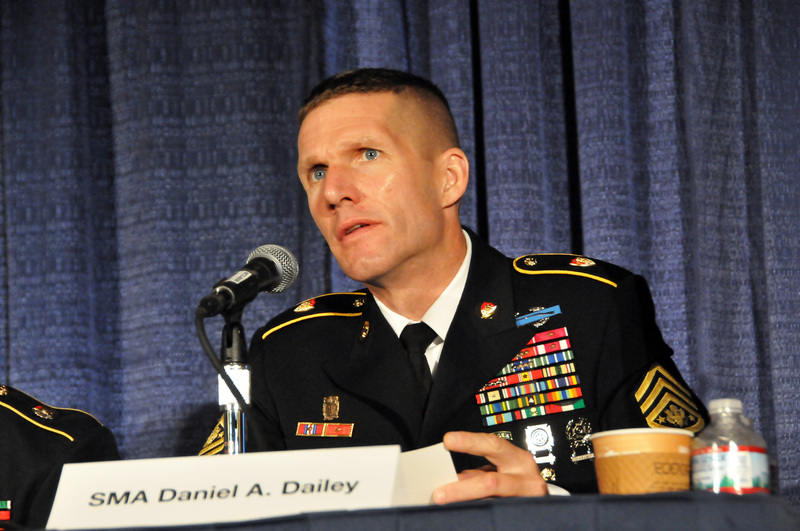 Maj. of the Army Daniel A. Dailey summed up the session on preparing the force of the future by unequivocally answering a question from the audience saying: “We cannot lower standards [as other services have done] and we have no intention of doing so in the future. We can get the numbers,” Dailey said, but the changing nature of warfare requires nothing less. In touching on recruitment, training and equipment, the panel, convened at the Association of the U.S. Army’s Annual Meeting and Exposition, addressed a number of positives – and a fair share of negatives – that have influenced readiness. That said, there are answers. Command Sgt. Maj. Anthony Bowers, U.S. Army Recruiting Command, offered up some stunning figures that reflect both the changing nature of today’s military and that of the greater American society. Over the past 20 years the proportion of young people with a parent who has served has gone from 40 percent to 16 percent, and the propensity to join the military today ranges 5 percent to 24 percent across the nation. Perhaps most shocking – or perhaps not – nearly 50 percent of 17-to-35-year-olds queried in a study could not name all active duty military services. “Our job is to sell the Army,” Bowers said, but the Army is up against stiff future employment opportunities. And there are a number of misconceptions about the military, and there remains a stigma that the Army, in particular, is a last choice among recent high school graduates. But the Army is addressing these concerns, according to James Cox, assistant secretary of the Army for manpower and reserve affairs. Command Sgt. Maj. Michael L. Gragg, U.S. Army Center for Initial Military Training, addressed, among other things, the Army Combat Readiness Test as a way to determine the likelihood of soldiers to physically perform their tasks. “We need to rethink our MWR [Morale, Welfare and Recreation] facilities, specifically gyms,” he said, making them training facilities as opposed to their current purpose as recreational facilities. Command Sgt. Maj. Rodger W. Mansker, U.S. Army Materiel Command, addressed supply problems and potential fixes in the materiel domain. “We have to reduce excess in the supply chain, particularly storage,” he said, “and we need a strategy to modernize the soldier equipping process,” he said. A five-year program to do so is now in the works, he said, designed to reduce a $10 billion excess to something closer to the current $1 billion allocation. The panel moderator was retired Command Sgt. Maj. Daniel K. Elder, an AUSA Institute of Land Warfare senior fellow.